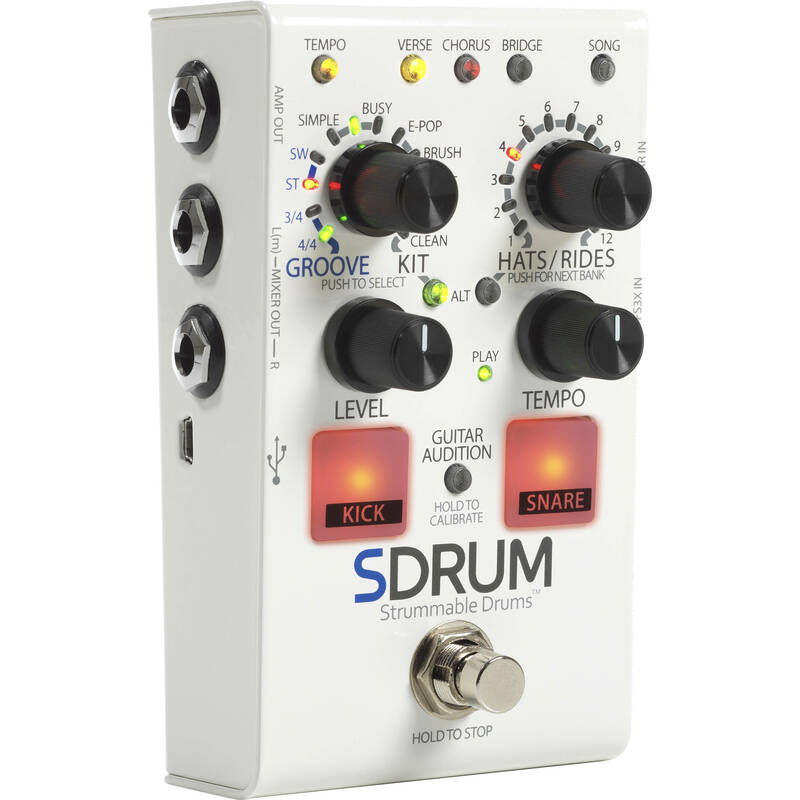 The DOD SDRUM Strummable Drums Pedal employs the proprietary BeatScratch technology to program kick/snare patterns by simply strumming the upper and lower strings of an electric guitar, acoustic guitar with pickup, or bass. It provides guitar and bass players with a quick and fun way to create beats for practice sessions, sketching song ideas, recording, or performing live. The SDRUM offers five drum kits each with high-quality drum samples covering a wide variety of genres. The samples come with multiple velocity layers, humanization, and minor variations for generating musical and realistic drum patterns. The unit can learn up to 3 parts per song and store up to 36 songs. Each song and part have various settings that can be adjusted at any time including time signature from 4/4 to 3/4, feel from straight to swing, embellishment amount from simple to busy, part intensity, tempo, and more. The SDRUM provides JamSync support to synchronize playback with compatible DigiTech JamMan Loopers (available separately) and lets you connect a DigiTech FS3X Footswitch (available separately) for additional hands-free control.